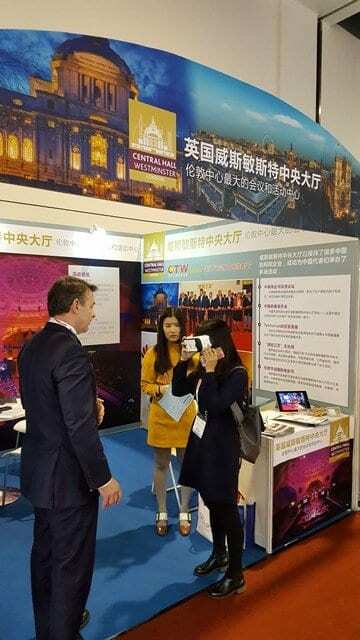 Central Hall Westminster announced the launch of its new virtual reality (VR) experience during a week-long visit to China. It was showcased at the IT&CM Exhibition Shanghai, the Department of Commerce in Zhejiang Province and at a meeting with the team at Alibaba HQ Hangzhou. Central Hall’s new virtual reality technology aims to showcase the venue’s versatility and range of event spaces to both international and UK buyers. The VR experience not only enables viewers to get a 360 degree view of the event spaces on offer throughout the central London venue in a virtual show-round, but also features a variety of live events scenarios as a fully immersive viewing experience. VR live events include the BBC’s New Year’s Bryan Adam’s concert 2015, amongst other high profile events. The VR experience has been created by Trek Wireless, creators of interactive digital assets for the retail and hospitality industries that work seamlessly across PC, tablet, mobile and VR devices. For further information about Central Hall’s virtual reality offering please visit https://www.c-h-w.com/vr.